A surreal, literary-based, 60-minute audio tour that uncovers dozens of the vessels still buried beneath San Francisco’s Financial District. James Marshall’s discovery of gold at Coloma in 1848 set in motion a world-wide migration of fortune-seekers to the gold fields of California. In the first year of the gold rush, over 62,000 of those immigrants came by ship, landing in San Francisco and abandoning their vessels as fast as their legs could carry them. By 1850, the bay held nearly 600 abandoned brigs, barks, ships, and whalers, left to rot by the starry-eyed Argonauts who had crowded aboard to reach their dreams. 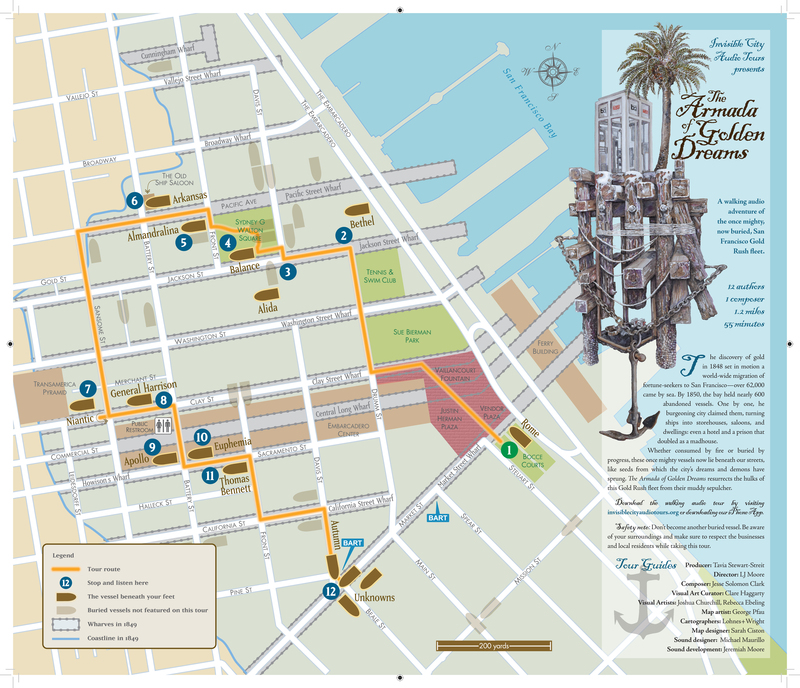 For most of the Gold Rush fleet, San Francisco was not only their last voyage, but their final mooring, as scores of those vessels still lie beneath the skyscrapers, restaurants, bars, and plazas of downtown San Francisco. 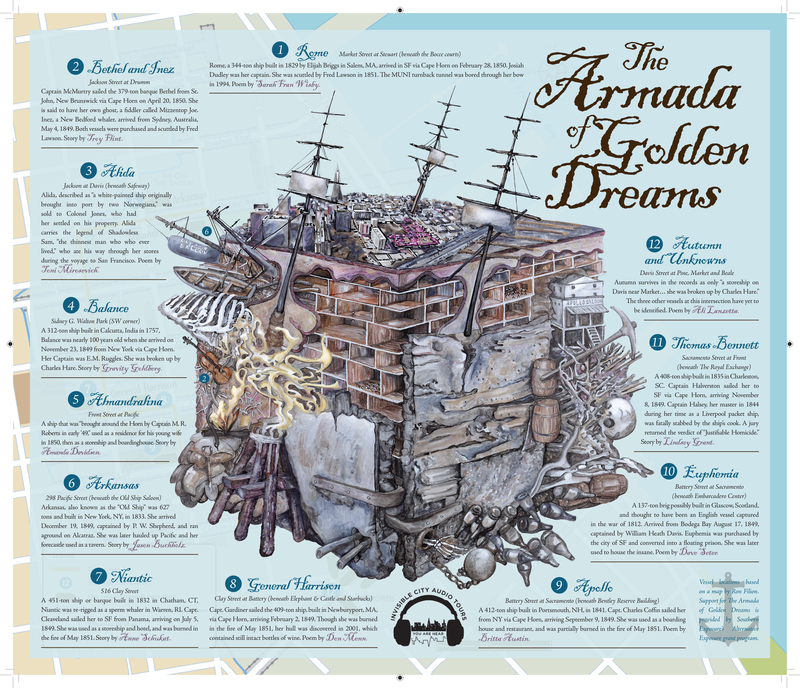 This spring, twelve Bay Area authors, one composer, three visual artists, and a team of designers will resurrect the history of this once mighty fleet. Would you like a beautiful, full-color, real map of your own for only 5 bucks?!! Fill out the contact form below with your mailing address. I will send you the paypal instructions. Thanks! 2) “Sunken and Forgotten.” San Francisco Examiner, August 31, 1890. 3) “Reminiscences: The Pioneer Storeships.” Daily Alta California, May 22, 1882. 4) To California By Sea: A Maritime History of the California Gold Rush, James P. Delgado. University of South Carolina Press, 1996. 5) “Gold Rush Jail: The Prison Ship Euphemia,” James P. Delgado. California History, Vol. 60, No. 2 (Summer, 1981), pp. 134-141. 6) “The Armada of Golden Dreams,” Walter J. Scott. San Francisco Chronicle, July 2, 1916. 7) “Reminiscences: Old Hulks and Storeships.” Daily Alta California, May 29, 1882. 8) California as I saw it; pencillings by the way of its gold and gold diggers, and incidents of travel by land and water. William S. M’Collum, MD. George H. Derby & Co., 1850. 9) “Reminiscences: The Last of the Storeships.” Daily Alta California, June 5, 1882. 13) Resource Recovery Project: Muni Metro Turnback Project. Allan James, Lori Harrington and William Self, 1995. 15) “A Charleston Forty-Niner. R. Bentham Simons.” The South Carolina Historical Magazine, Vol. 57, No. 3 (Jul., 1956), pp. 156-178. 16) “Gold Rush Jail: The Prison Ship Euphemia.” James P. Delgado. California History, Vol. 60, No. 2 (Summer, 1981), pp. 134-141. 17) “Gold Rush Entrepot: The Maritime History of the Rise of the Port of San Francisco.” James P. Delgado, 2006. 18) “Hospitalization of the Mentally Ill During California’s Early Years: 1849-1853.” Stuart A. Brody, Ph.D.
20) “All Hands Have Gone Downtown: Urban Places in Gold Rush California.” Robert Phelps. California History, Vol. 79, No. 2, Rooted in Barbarous Soil: People, Culture, and Community in Gold Rush California (Summer, 2000), pp. 113-140. 21) The Annals of San Francisco. Frank Soule, John H. Gihon, MD, and James Nisbet. D. Appleton & Company, 1855. 22) “Archaeological Investigations of a Mid-19th-Century Shipbreaking Yard”, San Francisco, California. Allen G. Pastron and James P. Delgado. Historical Archaeology, Vol. 25, No. 3 (1991), pp. 61-77. 23) “Thomas A. Ayres and His Early Views of San Francisco: Five Newly Discovered Drawings.” Nancy K. Anderson. American Art Journal, Vol. 19, No. 3 (Summer, 1987), pp. 19-28. 24) “Golden Gate Castaway: Joseph Heco and San Francisco, 1851-1859.” Robert F. Oaks. California History, Vol. 82, No. 2 (2004), pp. 38-58. 25) “Muybridge’s Window to the Past: A Wet-Plate View of San Francisco in 1877.” Paul A. Falcone. California History, Vol. 57, No. 2 (Summer, 1978), pp. 130-157. 26) “No Longer a Buoyant Ship: Unearthing the Gold Rush Storeship Niantic”. James P. Delgado. California History, Vol. 58, No. 4 (Winter, 1979/1980), pp. 316-325. 27) “Paradox Town: San Francisco in 1851. Julia Cooley Altrocchi.” California Historical Society Quarterly, Vol. 28, No. 1 (Mar., 1949), pp. 31-46. 28) “…so many ghastly piles of marine debris”: discovery of the whaling ship Candace in downtown San Francisco.” James M. Allan. Proceedings of the Society for California Archaeology, Vol 20 (2007), pp. 9-14. 29) Shew Panorama, 1853. Panorama of the Waterfront, From Beale and Second to Rincon Point. William Shew. Roy D. Graves Pictorial Collection, Bancroft Library, University of California, Berkeley. 30) 1872 San Francisco Panorama from Rincon Hill. Eadweard Muybridge. Bancroft Library, University of California, Berkeley. 31) “San Francisco in 1851 as Described by Eyewitnesses.” Lula May Garrett. California Historical Society Quarterly, Vol. 22, No. 3 (Sep., 1943), pp. 253-280. 32) “San Francisco’s South of Market District, 1850-1950; The Emergence of a Skid Row.” Alvin Averbach. California Historical Quarterly, Vol. 52, No. 3 (Fall, 1973), pp. 197-223. 33) “A Gold Rush Enterprise: Sam Ward, Charles Mersch, and the Storeship Niantic.” James P. Delgado and Russell Frank. Huntington Library Quarterly, Vol. 46, No. 4 (Autumn, 1983), pp. 321-330. 34) “San Francisco, 1851: The Golden City as the Argonauts Saw It.” Robert A. Weinstein. California Historical Society Quarterly, Vol. 47, No. 1 (Mar., 1968). 35) “Shanghaied! The Systematic Kidnapping of Sailors in Early San Francisco.” Lance S. Davidson. California History, Vol. 64, No. 1 (Winter, 1985), pp. 10-17. 36) The Argonauts of California. Charles William Haskins. Fords, Howard & Hulbert, 1890. 37)”Tourists in Gold Rush San Francisco.” Charles Lockwood. California History, Vol. 59, No. 4 (Winter, 1980/1981), pp. 314-333. 38) “Vanished Waters of Southeastern San Francisco: Notes on Mission Bay and the Marshes and Creeks of the Potreros and the Bernal Rancho.” William Crittenden Sharpsteen. California Historical Society Quarterly, Vol. 21, No. 2 (Jun., 1942), pp. 113-126.